Traffic flow in our communities directly affects the environment because of pollution caused by idling and stopped vehicles. Many communities are looking for ways to improve traffic flow on their roadways without compromising safety, especially in mixed-use areas with residents and commuters traveling to and through an area. 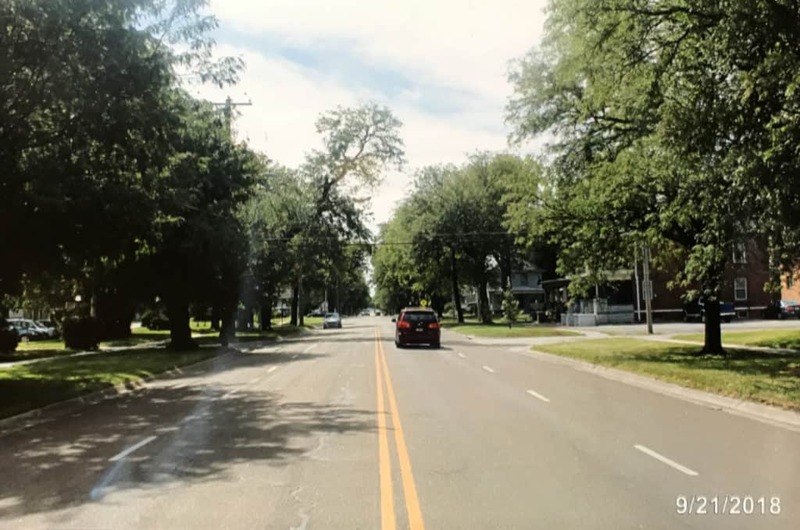 In this report, Richard Schmeling describes how Lincoln, Nebraska, has applied the concept of 2 +1 (two lanes of traffic with a shared center turn lane) to improve traffic flow and reduce idling and stopping, while also increasing the safety, bikeability, and walkability of the area. 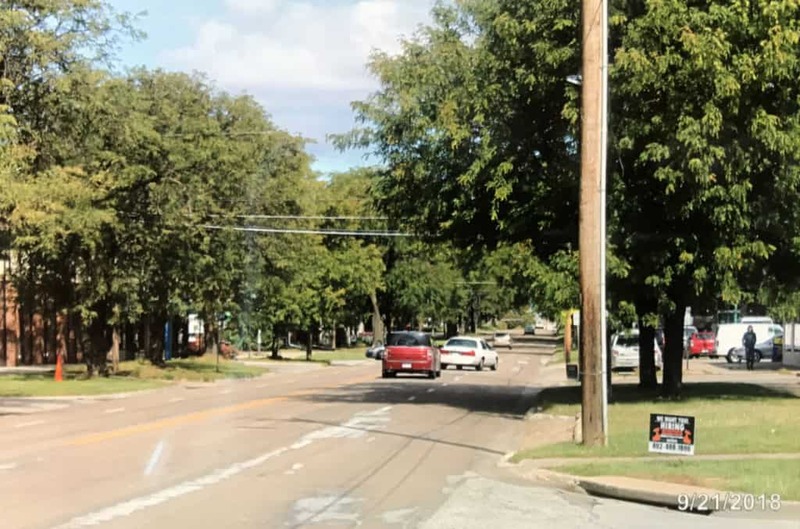 Following a long hearing with many testifiers, the Lincoln (Nebraska) City Council decided to convert South 13th Street, from K to South Street, from two lanes each direction to one lane each direction with a center turn lane. This proposal was advanced by the Near Downtown group and supported by other neighborhood groups in the area. Opponents were worried that the change would bottleneck traffic using 13th Street to and from downtown. Evidence was presented by City Traffic Engineering that at its current level of about 10,000 vehicles per day, the 2 + 1 would handle the traffic nicely and may even speed up traffic flow. How Can Three Lanes Work Better than Four? The answer to this question is left-turn movements. As 13th Street is currently marked, there are no left turn lanes. A car wishing to turn left must be in the inner lane and often has to come to a stop because of oncoming traffic. Cars behind stopped cars in the inside lane must either also stop or, if possible, move to the curb lane to pass. The 2 + 1 with left turn lanes at intersections puts a left-turning car in a pocket out of the way of traffic behind. Thus, the overall flow of traffic is improved. A Federal Highway Administration study found that the conversion from a four-lane to a three-lane street reduces the total number of crashes by approximately 29 percent. Also, as my friend Ralph pointed out, 13th Street in the area in question is in an old part of town. Storm sewers crossing 13th Street cause the street to “hump up” at intersections, and drivers tend to use the current inside lanes to avoid driving over the humps, which lessens the traffic flow because fewer vehicles are traveling in the curb lanes. The nature of gasoline and diesel engines used in cars and trucks is that emissions are worse from an idling vehicle compared to a moving vehicle. This is especially evident when a diesel-powered vehicle that has stopped takes off, emitting a puff of black smoke. By keeping traffic moving with the shared left turn lane, there will be fewer vehicles stopped along 13th Street and, thus, fewer emission problems. We know that 50 percent of global warming is due to transportation. Lessening harmful emissions from stopped and idling cars and trucks has got to help the situation. I reviewed reports from the Iowa Department of Transportation about 15 streets in Iowa being converted to 2 + 1. Although a number of these streets were in communities smaller than Lincoln, two reports involved roadways in Des Moines and Sioux city, cities about the size of Lincoln. In each of the 15 reports, traffic actually flowed more quickly when the streets were changed to 2 + 1. Other studies indicate that this improved traffic flow will work for streets with up to 15,000 vehicles per day. Currently, South 13th Street in Lincoln has a daily traffic count of a little over 10,000 vehicles per day. The 2 + 1 conversion also decreased the number of traffic accidents on average of 28 percent for all the projects. Reasons for this decrease are fairly obvious—(1) there are fewer rear-end crashes caused by following drivers failing to observe a vehicle ahead stopping to make a left turn and (2) left-turning vehicles have to deal with only a single lane of opposing traffic instead of two, as in the case of 13th Street as presently marked. The change to 2 + 1 provides additional benefits in terms of pedestrian and bicycle safety. As part of the project, pedestrian crosswalks will be better marked with warning signs that motorists are approaching a crosswalk. Instead of having to cross four lanes of moving traffic, pedestrians will only have to cross two moving lanes. The 2 + 1 configuration also means the pedestrians will have a shorter path to traverse the new lanes than the four lanes of current arrangement. One social worker testified at the council meeting that she knew of parents living east of 13th Street who would not permit their children to go to activities at the F Street Recreation Center on the southwest corner of 13th and F because it was too dangerous to cross 13th Street as it now is. 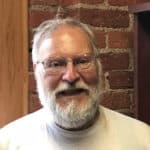 A citizen who is partially visually impaired told of his constant fear of crossing 13th Street because of his inability to see approaching cars. With marked crosswalks, he will feel much safer in crossing since cars must yield to pedestrians in the crosswalk. There will be bicycle lanes along the curb on both sides of 13th Street, which will improve safety for bicycle readers using the street. It is likely that current on-street parking on South 13th Street in some areas will be eliminated as part of the 2 + 1 conversion; however, a number of residences along South 13th Street will also benefit since it will be easier to back out of their driveways with only two lanes of moving traffic instead of four. If This Doesn’t Work, What Do We Do? This 2 + 1 conversion will be done rather easily by altering street markings rather than putting in concrete islands. If traffic flow goes over the daily count of 15,000 vehicles in the future, it will be easy to remark the street for four lanes of through traffic. This was confirmed by Miki Esposito, director of transportation and public utilities for the City of Lincoln. One of the citizens testifying at the council hearing was a Registered Traffic Engineer not employed by the City of Lincoln. He had reviewed the 2 + 1 proposal for South 13th Street and said it would work given the current daily traffic count. He also noted that four-lane roadways without a center median (13th Street currently has no center medians) are the most dangerous types of roadways and that there is a trend nationally to not build new four-lane undivided roadways and build 2 + 1 projects instead. Currently, StarTran Route 13 (South 13th) runs along South 13th Street from F Street past South Street. StarTran rules require that their buses pick up and discharge passengers at the curb of the street for safety purposes. This means that the Route 13 buses will have to move into the bike lanes when stopping at Designated Bus Stop locations. This interference should be minimal since South 13th sees a bus each way every half hour, and buses will not have to stop at all bus stops every trip. There are other instances of StarTran buses having to go into bike lanes on other routes in Lincoln. The stripes for bike lanes in this area are in the form of dashes to remind the bicycle riders that the bike lane is not exclusive to bikes and they have to share in these areas. A bit of bike rider instructions on this point may be needed. The 2 + 1 concept for streets may be familiar to some Lincoln drivers. A number of years ago, there was a proposal to wide 27th Street, 33rd Street, 40th Street, 48th Street, and 56th Street to four lanes in the south part of Lincoln. In many areas, this would have required the removal of a great number of large, established trees along the streets and taken away yard space from the residences along these streets. Neighborhood groups mobilized to oppose this proposal. On South 40th Street where I lived at that time, our unpolitical neighborhood suddenly formed our South 40th Street Association. We reached out to the other associations and banded together. When the matter came up for public hearing, the city council chamber was packed with people standing and overflowing out into the hallway. The four-lane proposal was soundly defeated. Today, those streets are all 2 + 1 streets and traffic flows well on them with the possible exception of 27th Street near the Lincoln Country Club. It is likely that as Lincoln examines various neighborhoods for street changes, 2 + 1 will be applied to other streets. LIBA (Lincoln Independent Business Association) opposed 2 + 1 and characterized it as a plan “to put streets on a diet” and force automobiles to take alternate streets. After the hearing, even Councilman Roy Christensen was persuaded that 2 + 1 was good for 13th Street and voted in favor of the change along with all the other council members present. It’s the old case of “whose ox is gored” with people in the neighborhoods wanting to calm traffic and make things safer and those who live in the outlying areas wanting streets that will get them to work and from work five minutes sooner. With the average commute time in Lincoln being about 24 minutes, we certainly aren’t at the point where we can compare with larger cities where auto commutes often take up to an hour or more each way. It may well be that someday the South 13th Street situation will have to be revisited if the daily car count goes over 15,000, but right now, the 13th Street area will be safer, more walkable and bikeable, and still move the traffic. Adoption of the 2 + 1 made good sense and makes the South 13th Street area more comfortably livable. Learn how Lincoln, Nebraska, has applied the concept of 2 + 1 (two lanes of traffic with a shared center turn lane) to improve traffic flow, reduce pollution, and increase safety, bikeability, and walkability.